A photo from 1966 of the flight crew for the X-15 which was developed to provide data on aerodynamics, structures, flight controls and the physiological aspects of high speed, high altitude flight. 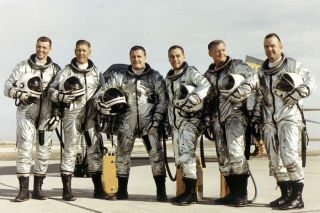 In this historical photo from the U.S. space agency, the X-15 flight crew is shown, left to right: Air Force Captain Joseph H. Engle, Air Force Major Robert A. Rushworth, NASA pilot John B. "Jack" McKay, Air Force Major William J. "Pete" Knight, NASA pilot Milton O. Thompson, and NASA pilot Bill Dana. First flown in 1959 from the NASA High Speed Flight Station (later renamed the Dryden Flight Research Center), the rocket-powered X-15 was developed to provide data on aerodynamics, structures, flight controls and the physiological aspects of high speed, high altitude flight. Three were built by North American Aviation for NASA and the U.S. Air Force. They made a total of 199 flights during a highly successful research program lasting almost ten years. The X-15's main rocket engine provided thrust for the first 80 to 120 seconds of a 10 to 11 minute flight; the aircraft then glided to a 200 mph landing. The X-15 reached altitudes of 354,200 feet (67.08 miles) and a speed of 4,520 mph (Mach 6.7).